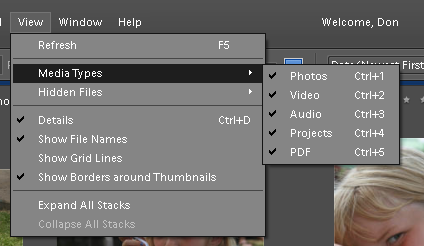 Have you ever made a slide show project in Photoshop Elements, saved it, then left it for a period of time, and have difficulty finding it again in the Organizer to continue working on it? This can be a common occurrence, especially if you have a large catalog and have added a lot of pictures since you saved your slide show project. True, when you first save it, it is in the top left position in the Thumbnail view of your Catalog. But as more and more pictures are added it hides itself in amongst your pictures. Yes, its thumbnail does have the Slide Show icon in the upper right hand corner of the thumbnail, but it is difficult to see for many of us, since it looks similar to the symbols used to indicate Stacks and Version Sets. Here is how I find my Slide Show projects quickly regardless of how old they are. From the Organizer, click on View > Media Types. All those types of media that are currently visible have a check by them in the dropdown list. I generally have check marks by each of the five types. Assuming they are all visible, clicking on one of the types will remove the check, and that type of media will no longer be visible. This works fine, except you can only remove a single type each time you go to the dropdown list. However, each type of media has its own keyboard shortcut. To cycle the visibility of your images off/on, press Ctrl+1, for video clips, Ctrl+2, and so on. So, assuming again that all of the media types are visible and you want to quickly locate your Slide Show project, press Ctrl+1, Ctrl+2, and then Ctrl+3, to remove all of your images, videos, and audio files from view. You now should be able to quickly see your missing Slide Show project. Once you find it, don’t forget to repeat the keyboard shortcut sequence so that all of your media files are again visible. And finally, you should periodically check to see that all of the desired media types are being displayed. Otherwise you may think that certain items are missing from your Catalog. I just opened a new page on Facebook. Hopefully you will find it interesting to follow me there and click saying you like it. Class registration will begin shortly for the fall term at both the South Bay Adult School and the Torrance Adult School, while PV NET registration is already active. I will be teaching two classes at PV NET this fall. The first one actually starts on August 23rd. These classes are not the same as those I teach at the other two schools. Here is the link to their description/schedule. Below is the link to the description and schedule for the classes I will be teaching at the South Bay Adult School. And finally, the classes I will be teaching at the Torrance Adult School are shown at the link below. I hope to see you in a class somewhere this fall. I have written before how I use the PSE Backup/Restore commands to not only back up my photos, but also whenever I upgrade to a new computer. My first blog post on the subject was in May 2008. That post focused on moving your images to an external hard drive. The basic concept is you use the PSE Backup command to capture all of your images, their tags, projects etc, and then use the Restore command to move them and the Catalog itself to the external drive. I have used this command pair several times over the years. Today, I used it again but with an added twist. My goal was to not only have my pictures on my second internal drive, Drive F, but to keep the Catalog file in the default location on the C Drive. Normally when you use the Backup/Restore command pair to relocate your Catalog and images, the Catalog file is put in a folder on the destination drive, in my case Drive F.
Remember it is the Catalog file that houses your preview images that you view when using the Organizer. External hard drives are generally not as fast as internal drives, at least currently. So, if you have moved your images and Catalog to an external hard drive, you may want to consider putting your Catalog file back onto your C Drive. You may not notice the difference for relatively small Catalogs, but it might slow down your working with the Organizer for large Catalogs. My prime photo Catalog has over 26K images, so I want to do anything that will increase the performance of PSE. That is why I chose to put my photos on a second internal Hard drive and not an external one. Here are the steps I did today. 1. I did a Full Backup to an external hard drive using the PSE Backup command. 2. Using the PSE Restore command, I restored my Catalog to a folder on my F Drive. 3. I then renamed my Catalog using File > Catalog > Rename to some other name. file to the default location on the C Drive, but the images remain on the F Drive in my case. 5. Finally, I reset the location where my camera’s pictures will be uploaded to reflect the new location on my F Drive, using Edit > Preferences > Camera and Card Reader. I did the above today, and everything seems to be working fine. I had done Step 1 yesterday, so I started with Step 2 today, which took three and one-half hours to complete. Also, after the Catalog was restored, it took a couple of more hours to generate all of the thumbnails. However, you can use the Organizer while this is going on. By the way, when you Restore your images to a new location/drive they still are also in their original location. Once you know the relocated Catalog/images are working fine, you can delete them from their original location. I normally do this in stages checking for any Reconnect problems as I go. That is what I’m about to do now.